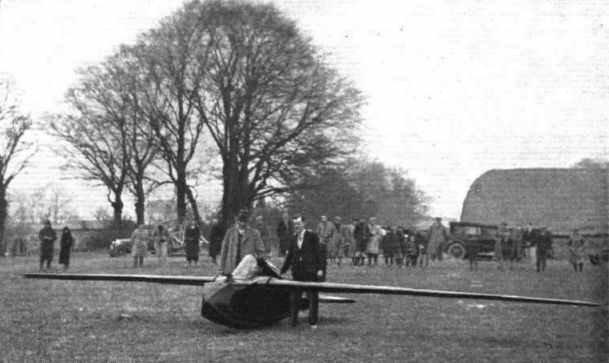 OF BIRD-LIKE PROPORTIONS: A three-quarter rear view of the Nyborg sailplane. The designer is standing by the right-hand wing tip and his assistant, Mr. H. Green, is in front. The dimensions are :- Area, 45 sq. ft.; span, 32 ft.; chord, 16 in. ; weight, 370 lb., including 150 lb. for the pilot; the gliding angle at 57 m.p.h., according to Mr. Nyborg's calculations, should be about 1 : 54. The large rudder is being used temporarily for auto-towing, and if possible will later be discarded for a much smaller one which will be assisted in obtaining directional control by two small drag-producing flaps under each wing-tip. The trailing edge of the wing inside the aileron is divided into three flaps on each side which can be used for increasing the effective camber and as air brakes. HIGH ASPECT RATIO: A front view of the Nyborg sailplane which gives a good idea of its narrow chord wings. Mr. T. G. Nyborg is on the left, Mr. H. Green on the right, and the pilot in the cockpit is Mr. L. C. Williams. The wing spar is a solid 4 in. by 3 in. spruce beam tapered from the root and the wing is plywood covered. To obtain his design Mr. Nyborg has scaled up the best soaring birds, thus his sailplane has the same loading and dimensions one would expect, say, an albatross of the same weight to have.